In today’s busy world, the demands placed upon staff by their employers can be tremendous. For those who are trying to get on in their career, these demands will often call upon you to put in more time and effort which, as a consequence, can often leave you susceptible to neglecting other areas of your life. This can sometimes lead to difficulties in your marriage as you find it hard to make time for your spouse and children when you feel as though you’re letting down your boss which might jeopardise your career. 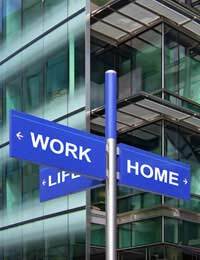 There is a real challenge of establishing a healthy work/life balance which is hard to achieve if you have a demanding career that might see you working well in excess of 50 hours a week, let alone 40. However, what further compounds the problem when you do come home from work or have some free time at, say, the weekend, is when you’re often too exhausted and emotionally drained from work to enjoy it and share it with others. However it’s achieved, finding a balance that works for you and your spouse is imperative if you want your marriage to remain strong. Even though some people manage to achieve a balance between the long hours of work and the amount of time they are at home with their family, your mere ‘presence’ may not be enough. Whilst you’ll inevitably be able to grab a cup of tea together occasionally or share the chore of doing the dishes, this is not enough. You need to make ‘quality time’ for each other. This is time in which you can relax together and to share each other’s company without the risk of interruption from phones and children, for example. (Although you’ll also need to make quality time for your children as a family unit too). So, you need to be able to set a period of the week, be it an afternoon, an evening or an entire day where you’ll both commit to not letting any interruptions get in the way. If that means turning all your phones off and escaping from the house to somewhere more tranquil, then so be it. Even if you have to stay at home because of parental duties, if children are old enough to understand, they need to know that this is ‘special’ time where they are not allowed to disturb you unless it’s an emergency. Better still, hire a babysitter or child minder for this allotted time. By ‘special’ time, this does not mean time where you bring your work woes home with you to moan about. So, even if you’ve had a bad day at the office, don’t let a bad mood spoil your ‘special’ time. Obviously, you’re likely to have to balance this up by having a mutual understanding that during certain times of the week, you may be home late from work or you might have to go away on business now and then. However, as long as you’re both committed to making space for a firm commitment to share each other’s company where you’ll not let anything interrupt you, then it’s far more likely that you’ll be able to juggle both your commitments to your spouse and to your employer more effectively. Providing you work hard when you’re supposed to and go the extra mile sometimes, most good employers will value the contribution you are making to the business and will not question your need to make time for your spouse and children too. However, if you find that’s not the case and they don’t respect your needs, then you need to question whether or not they’re the right employer for you. After all, surely your spouse and children need to be placed at the very top of your priorities when all is said is done? The simple truth is that if you don’t view life in that way (no matter what materialistic rewards your career may bring), the likelihood is that your marriage will eventually start to suffer and could even run into trouble. Therefore, it’s important that you put the time and effort in to keep your marriage alive and healthy.